In the Year Twenty Fourteen, it will be more important than ever to be able to differentiate yourself and easily express what’s important to you. Here I have demonstrated an awesome tool that lets any Twitter user instantly make a video "movie trailer" complete with a soundtrack, showcasing the best Twitter moments, including: top photos, tweets, and followers. Get the best of your profile pages from Facebook, Twitter, LinkedIn, Foursquare, YouTube, Blogs, and mashes them together into a dynamic graphical visualization of who you are and where you came from. Share Graphics Via Social Media Cards. It appears as if the lines between your professional and personal identity online are thinning. This visual personalized bio is created by integrating the educational history, places lived, photos taken, and tweets. YouTube videos, LinkedIn profile, Facebook posts, and other social media networking sites are linked automatically to keep the profile live and updated. Showcase your achievements and also your interests in real-time by embedding stuff from social media sites. Online equivalent of an elevator pitch. A bite sized encapsulation of what makes you awesome. You can look back to see your own activity, from your most-shared tweet to your most-used words, and even your "Golden Follower." Click various pages above to see the demo. Are you ready to try innovative profile to greet the New Year 2014? 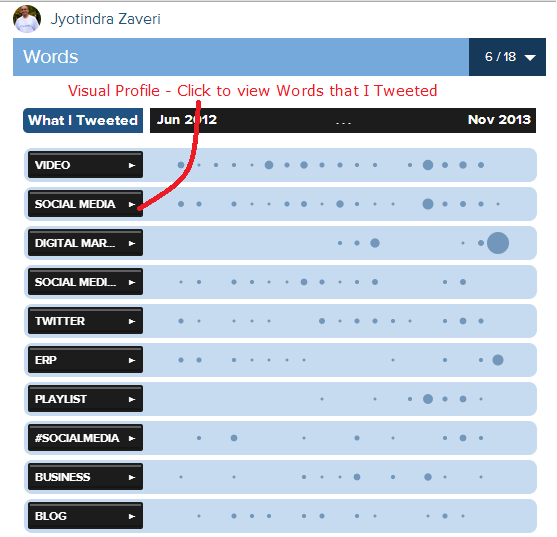 Hope you will Like this innovative way to showcase a profile, and Share it.